The so-called “Bomber Barn” stood for many years near the southeast corner of Ohio Route 107 and County Road 6. The single story, wooden frame structure was originally the Valley View rural schoolhouse. Former teacher Ramona Heinzerling recalled that the school was closed following the 1935-1936 school year. Local newspaper accounts indicate that the structure was sold in 1940 and was converted into a storage building. 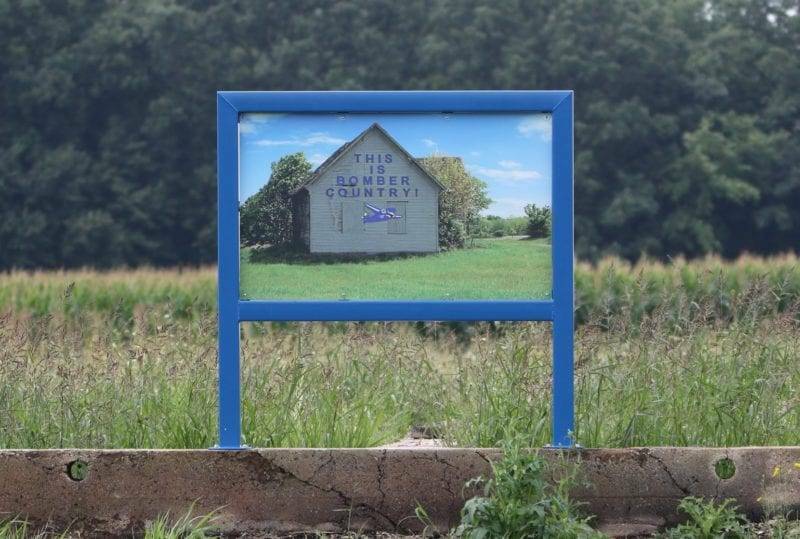 In 1974, the words “This Is Bomber Country” were painted on the building’s north side when the Edon High School boys’ basketball team advanced to the regional tournament. A Blue Bomber plane was later added by the Edon art class. The structure was vandalized a number of times over the years, including fires intentionally set in 2007 and 2008. The structure has since been razed. A commemorative marker with a photograph of the former Bomber Barn was erected on the site. This September 1986 photograph of the Bomber Barn and August 2016 photograph of the Bomber Barn marker are from the Richard L. Cooley collection–Courtesy of the Williams County, Ohio, Local History Exchange. Be the first to comment on "(Early 1900’s) – Former Edon School House; “Bomber Barn” (Edon, Ohio)"